Finding and mounting shared folders is Smb4K's primary use, and one it does very well. The interface is simple and easy to use. An icon resides in the system tray for easy access. If you have a share bookmarked you can right-click the icon and select the appropriate one to mount it. If not, left-clicking on the icon will load the main program. Smb4K presents a two pane interface. The left pane contains two tabs. The default is the Network Browser and it works exactly as you'd expect. It queries the network for available shares and displays them in a tree view. Selecting one of the shares mounts it and causes an icon to display in the right pane. The second tab is the Search Dialog. I don't use it much on my home network because I set up all of the shares and know where they are, but I can see it being useful on a larger network where finding a share is much less intuitive. The right pane contains icons representing all of the mounted shares and gives you the ability to browse, syncronize, or unmount any of then. Once a share has been mounted it's available for syncronizing. To trigger a syncronization either right-click on a mounted share in Smb4K and select Syncronize; or right-click on the system tray icon, highlight Mount Shares, and expand the menus until Syncronize is listed. 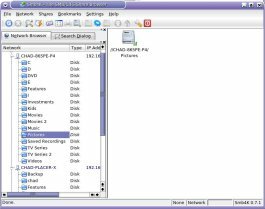 It's possible to designate either the local or the remote drive as the source. One key item of note is that you have to select directories, it doesn't support individual files. The best use is when you create specific folders that you want to keep synced between a couple systems. I use it for my family photos. My editing and tagging is done using Digikam on my laptop, but I keep a copy of all of the files on a home server. Using Smb4K's syncronize command is an easy way to update any changes once I am done. When setting up the folder paths the source will default to the mapped drive. If you want to change the source to be the destination, as I do, the swap path button makes it simple to reverse directions. My final item of note is that a directory will be created at the destination location that matches the source folder. This means that when syncronizing a share called Pictures that maps to a folder of the same name, I cannot select my local folder called Pictures as the source. A subfolder must be selected because the entire folder will be copied and not just the files within. If you don't you'll end up with one Pictures directory inside another. Smb4K serves as a convenient syncronization tool, but it's not for everyone. If you are looking for a way to syncronize on a schedule, or automatically based on an action or system state, another app will be needed. But if all you need is a quick sync that you will manually trigger, it's a very useful tool.